Do you know what is the latest craze in Facebook? If you say Candy Crush, then you are extremely right. This application took the world by storm whether it is in Android, iOS, tablet and personal computer platform. The game comes with different goals and difficulty per level. To fully appreciate the game, here is our Indie Games Day review. 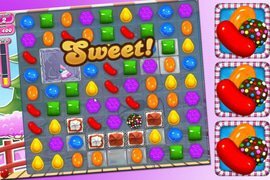 As per this Candy Crush review, it is just like your match-three puzzle games, but the difference is that it comes with sweet and delicious pieces that give extra moves or combo shots when paired with 4 or more pieces. The gaming community considered it as the sweetest game because of its candy land world and tasty designed graphics. When you enter the game, you are welcomed by Mr. Toffee and Tiffi who will warmly present to you the world of candy. It is somehow similar with Bejeweled, but what made it exceptional is its challenging goals and limited amount of moves. 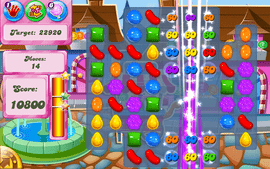 Every level in Candy Crush is a new adventure and is packed with delicious victory when completed. We can assure you that you will never find it boring because each level is different and packed with various goals and game field. The bottom line of its goal is to reach it under a certain number of times and moves. Some levels ask you to remove all encased sweets in a jelly while some levels ask you to drop some ingredients in the bottom part of the grid. In fact, a lot of the Microgaming slots we've played are based on the same premise, which is perhaps why both types of games are so popular. A Candy Crush review shows that it is not only a matter of chance and luck because you also have to use your logic since the numbers of moves are limited. It comes with 100 levels and special episode like Lemonade Lake and Candy Factory. When you perfected the level by reaching the required score, you are awarded with three stars. But if you fail, you can always come back to that level to play again. The good thing about this is that your gaming experience is controlled in a manner that you only have 5 chances when you failed to complete the level. When you ran out of lives, you are given the options of waiting for the health bar to be full again, or by asking friends in the social media for life. The shop under the brand gives players various offers like Charm Stripes, Frozen Time and others. Overall this application is one of the best time wasters around. You will never find it boring because the game interface is challenging, but the graphics and sound effects will thrill and encourage you more to create combos and play more.